In 2018 many US businesses benefited from robust economic growth, tax reforms and buoyed business confidence, leading to an 4% decrease in corporate insolvencies. 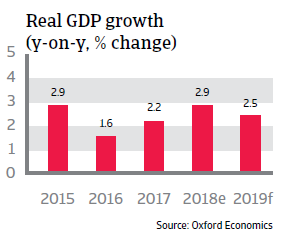 However, despite a still solid GDP growth outlook risks for the corporate sector are increasing in 2019. The strengthening USD and potential trade barriers strain US exporters. Domestically, changing shopping patterns, especially the shift away from mall shopping, has already caused major bankruptcies in the retail sector – a pattern which should persist in the coming years. Additionally, higher interest rates are increasingly making financing more expensive. 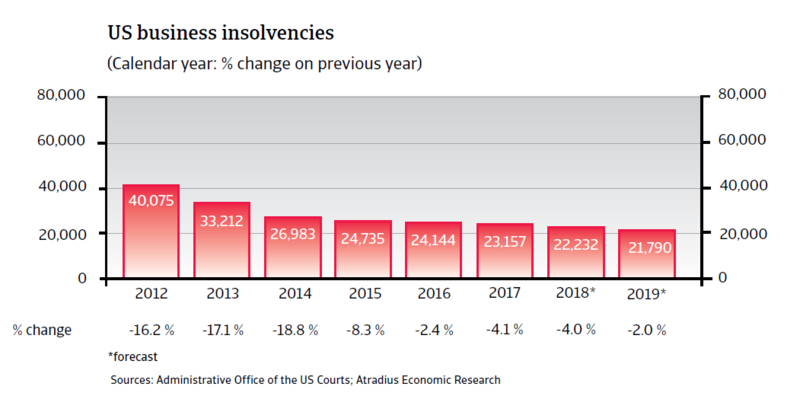 Therefore, US business insolvencies are forecast to decrease only 2% or to level off in 2019. US economic growth was broad-based in 2018, with private consumption as the primary driver, as unemployment decreased to less than 4% in 2018. Despite trade policy uncertainty, business investment continued to grow steadily, supported by tax cuts, deregulation and higher government spending. A GDP growth rate of 2.9% is expected in 2018. In 2019 the economy is forecast to grow 2.5%, underpinned by persistently strong household and business confidence. 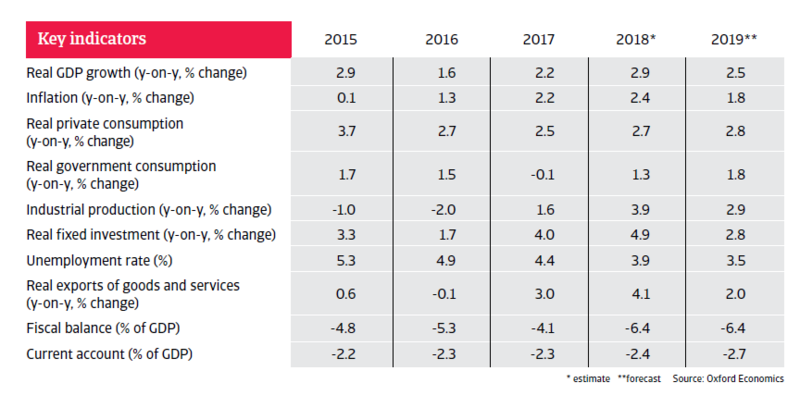 Domestic demand is expected to remain robust, and private consumption is set to grow by more than 2.5%, sustained by a very tight labour market, as employment growth remains robust across a wide range of sectors. While energy sector activity remains a key driver of the strong business outlook the overall momentum is beginning to wane, as the lagged effects of tax cuts fade out, the strong USD weighs on export competitiveness, and higher oil prices and import tariffs increase domestic price pressures. 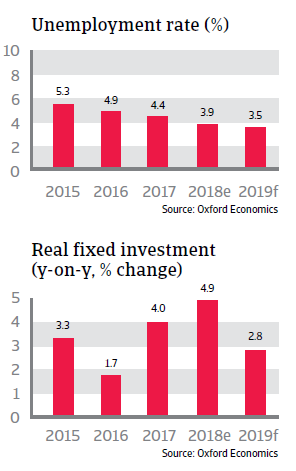 Therefore, investment growth is forecast to slow down in 2019. 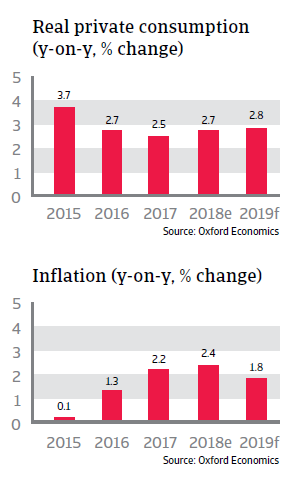 Higher wage pressures have led to rising inflation, which is expected to remain around 2% in 2019. As wages are rising further this should not weigh too heavily on consumers spending power. The US Federal Reserve (Fed) increased interest rates in December to a range of 2.25% to 2.5%, reflecting the strength of the domestic economy. While this will make borrowing more expensive and potentially weigh on business activity and purchasing power, current credit conditions remain looser than their long-run average. Monetary policy risk (rapid interest hikes in 2019 could adversely affect businesses finances and investment) has abated somewhat, as the Fed is expected to slow its pace of monetary tightening in 2019, due to increased uncertainty in the global economy. However, fiscal, and trade policy risks have increased, posing a double threat in the face of an exceptionally strong domestic economy. There is still confidence that the next recession is not coming up just yet in 2019. However, the risk that a downturn comes sooner than expected has increased, possibly reducing the government’s levers to address it. While robust economic growth and low unemployment should help rein in the fiscal deficit, massive tax cuts and increased public spending are sharply widening it. 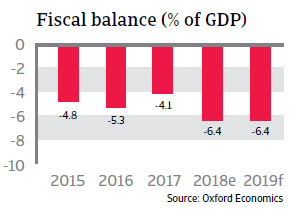 The stimulus is indeed contributing to higher GDP growth, but not sufficiently fast enough to keep the deficit in check, which is expected to have widened to more than 6% of GDP in 2018 and to stay at this high level in 2019. Most critically, less fiscal space and higher debt levels will limit the government’s policy options to support the economy in case of a recession, potentially leading to a deeper downturn. 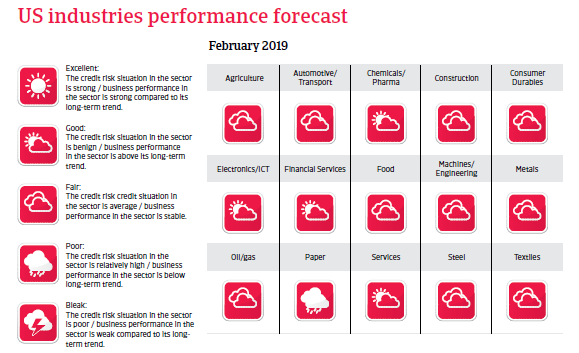 Trade policy uncertainty is one of the top risks to US businesses and consumers in 2019 that may bring the next downturn on more quickly than expected in the face of current economic strength. Retaliatory tariffs are already having a negative impact on US exports. While the USMCA agreement reduces trade risks with Mexico and Canada and a trade dialogue with the EU is ongoing, the incumbent administration’s trade policy stance remains highly uncertain. Moreover, with all the focus on China, the risk of further retaliation continues to increase. The negative consequences for some sectors like technology, ICT and agriculture could spell serious damage for businesses. At the same time, US import tariffs are set to increase inflation by making imports more expensive.